Zakuro Fujiwara is the fifth and final member of the original Tokyo Mew Mew team. 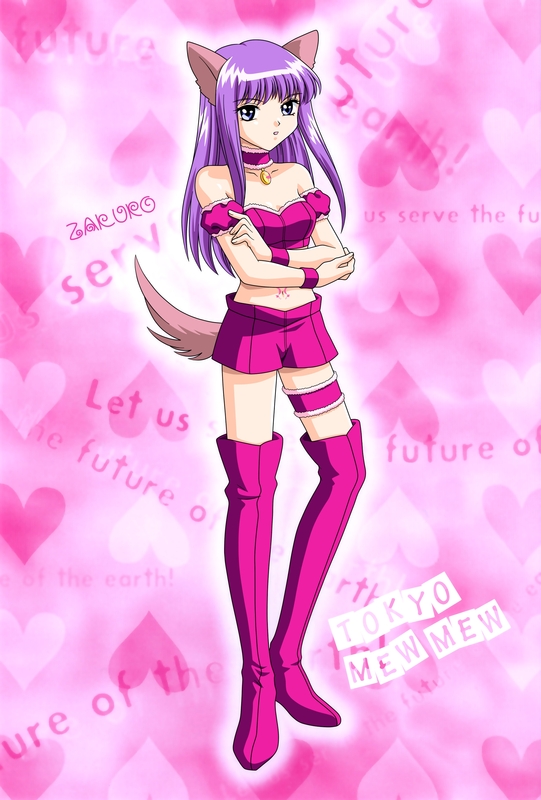 Her Mew form is Mew Zakuro (sometimes spelt as Zacro) and she is infused with the DNA of a Grey Wolf. She is the oldest of the original Mews and works as a professional model and actress. Zakuro is one of the few characters in the original series to have a "darker" personality. She initially has a sort of "lone wolf" persona, refusing to join the Mew team until they come to her aid. After joining the team, Zakuro is presented as a mature character and serves as the big sister of the group. She is regarded by many characters (especially Mint, who idolizes her) as having a calm and cool personality. In her human form, Zakuro has dark blue eyes and long, dark purple hair that she sometimes puts in a braid. Or as Mint describes it: "long, glossy, raven hair" with "dark, intelligent, yet sensitive, sapphire-colored eyes" and "long, strong and thin legs". Because of her career as a model, Zakuro is the character who wears the greatest variety of clothing throughout the series. When working at the Café, she wears the standard uniform in purple with lighter pink accents. When transformed, Zakuro's hair becomes a brighter shade of purple and her eyes a lighter shade of blue (or purple in certain colored illustrations from the manga). Her Mew costume consists of a purple tube top with pink trim (it looks white in some art or frames in the show), a pair of flared short shorts, purple thigh-high boots, and a pair of matching wrist bands. She also wears the standard arm puffs, garter, and choker in her signature colors. Zakuro also gets the grey-ish ears and tail of her infused animal. Her weapon is a whip shaped like a cross (although dubbed versions such as the English "Mew Mew Power" removed any references to religious symbols) that goes largely unnamed, but is sometimes referred to as the ZaCross Whip. The main body of her weapon faintly resembles a flute. It is light purple and has pink gem-like ends (more dynamic shots of the weapon such as the first shots of her attack reveal a rose-like shape), and the horizontal portion of it is gold. At the center, where both lines perpendicularly intersect, there is a golden decal with a pink heart in the centre. In Whiteweaver's fanfiction, Zakuro has left the Mew Mews, now on her last year of high school, to focus on her modelling career abroad, although she still keeps in contact with the rest of the team. She has become much taller over the years, and has had her hair cut short with her bangs shoulder-length at the front and barely chin-length at the back. In Mew Mew Power: Apprentice, Zakuro's name is changed to Renée Roberts and a secondary supporting protagonist. She is now eighteen years old and is shown to be kind, stoic, and strong, as well as serving as the mature voice of reason among the Mews. Since her own Mew powers are disappearing, she's taken on an apprentice Mew by the name of Pheobe Jones. Zakuro is seemingly on vacation with the other Mews during the beginning of the story. The team later discovers that the Tokyo Mew Mews have been captured and are being held hostage by the aliens. They are later freed by Natasha and Kashi and Zakuro aides in the final fight against Shinichi. During Mythical Mew Mew, Zakuro is around 26 years old.